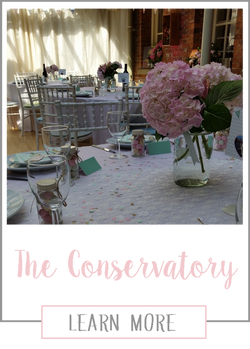 ​As we run the weddings during the summer holiday period we don't promote the venue as if it was a busy high volume conference or wedding venue. We run approximately 10 weddings a year, so, it could be said the venue is pretty exclusive! Throughout the year, Quinton House is a renowned private school. Outside of term time Boutique Weddings work exclusively with the school. The first couple of days in the holiday are spent rigging, and then once the school is decked with pretty wedding bits, and importantly the bar is place... it's a wedding venue, you would never know any different! The style of the wedding at Quinton is very much based around the theme of the English Country Garden Party. We like to think of you hiring a beautiful country house for the day! The venues capacity is 80 guests for the day, increasing to 120 for the evening reception. The Civil Ceremony can be held in the Ballroom which is simply stunning. Some of Northampton's finest painting are shown here, there isn't many rooms as special as this one to get married in! As if the inside isn't special enough. The grounds at Quinton are beautiful, and we have been lucky enough to have a new edition of rattan furniture to style the space.